Anyone who has spent time gaming knows that a good headset can make all the difference in the world. Being able to hear the environment around you and communicate with your friends and teammates are invaluable abilities when gaming. 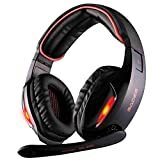 Gaming headsets are typically used for competitive gaming, however they can also give you a more enjoyable experience when playing a more relaxed game or even streaming videos or music. 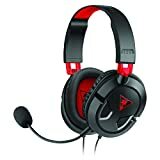 The gaming headset market is typically dominated by headsets costing hundreds of dollars, however, there are plenty of people who would rather spend the extra money elsewhere and are in need of an affordable, but high quality, gaming headset. We took a look at the gaming headsets on the market that are all priced under fifty dollars in order to bring you a list of the five best gaming headsets that won’t break the bank. We began our search for the best budget gaming headset by, obviously, narrowing our focus to the headsets at an affordable price point. We were sure to take into account the reputation of each manufacturer. 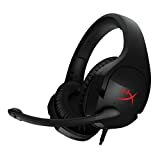 We’ve looked over countless gaming headsets that are each sure to give you a great experience while gaming. When compiling our list, we took into account the following features. We determined this final list by pouring over user reviews and feature lists as well as taking into account what features are most important in a gaming headset. We tailored our list to the gaming headsets that will give you the best experience possible while also remaining affordable. We compared every nuance of each of these headsets and weighed each category in order to bring you the five best gaming headsets under $50 on the market. When it comes to a gaming headset, nothing is more important than sound quality. A good headset will let you know where your enemies are and keep you aware of your environment. You’ll want to be able to hear every sound around you in order to stay aware of your surroundings. We prioritized gaming headsets that pack high quality sound, as well as high quality sound technology while still remaining affordable. Offering high quality stereo sound is incredibly important, but we also took special notice of headsets that pack surround sound that are sure to give you the best gaming audio you’ve ever heard. We poured over the specifications of each of these headsets to make sure none of them will disappoint when it comes to sound quality. Prioritizing sound quality helped us to make a fully informed and thought out comparison of each of these headsets and allowed us to decide which gaming headsets were worthy of our list. The second feature we prioritized when making this list was the comfort and design of each of these headphones. A good headset will be comfortable even through hours of gaming, and won’t cause you to have any headaches. We focused on headsets that put emphasis on comfort. Since you’ll be using your new gaming headset every day, we wanted to bring you designs that are sure to stay comfortable, while also complimenting your gaming setup. A lightweight design makes all the difference in the world, as it reduces unnecessary strain on your head and makes sure you won’t have to take breaks from wearing your headset. An often overlooked aspect of gaming headsets are the ear cups. Good ear cups will feel comfortable while wearing them, while also allowing air through in order to keep your head cool. We gave extra points to headsets that went the extra mile to bring you premium comfort at an affordable price. As team based games become more and more popular, you may found yourself having to communicate with your teammates more. And in the heat of battle, a missed call out or command can mean the difference between victory and defeat. A high quality microphone will make sure that your teammates can always hear you. In addition to sound quality, we gave extra points to microphones that pack some extra features into the headset. For starters, when you decide to take a break from competitive gaming you may not want your microphone in front of your face. Some headsets allow you to swivel or retract your microphone, and we were sure to pay attention to these features. In addition to a retractable or foldable microphone, noise cancelling is extremely important when it comes to communication. Being able to filter out background noise will make sure that your teammates can always hear you regardless of your real life environment. Having to minimize your game or go to a menu in order to control your audio can be tedious and frustrating. Being able to make split second decisions about your audio levels is an invaluable tool that we were sure to keep an eye out for. We gave extra points to headsets that include some sort of convenient and effective audio control solution that won’t take you out of the action for any longer than you need to be. The final feature we focused on isn’t very flashy or exciting, however it is vital to your experience. Being able to easily connect your headset without worrying about disconnecting or any other issues is incredibly important to your gaming experience. We prioritized headsets that have easy to use and high quality connectivity options. Our #1 pick for best gaming headset under $50 is the Logitech G430 DTS. Starting with sound quality the G430’s sport impressive Dolby 7.1. Surround sound allowing you to experience and immersive 360 degree sound field that is sure to fully immerse you in your gaming environment. Coupled with the Dolby technology are impressive 40mm drivers for great sound. 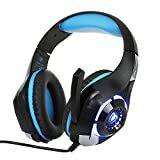 These headphones pack the best sound quality available for the price and rival that of multi hundred dollar gaming headsets. The design of the G430’s is quintessential Logitech design, as it sports a pleasant design with classic Logitech blue coloring. The design comes with a comfortable lightweight design as well as a comfortable headband. The earpads of this Logitech system were the best we reviewed as they reduce heat and moisture build up in order to keep your ears comfortable. They also swivel 90 degrees allowing you to adjust them for the best bit for you. The microphone on the G430’s is equally impressive. It has noise cancelling functionality that reduces background noise for clear voice chat communications. In addition to sound quality the microphone folds up for when you don’t need it. One of our favorite features of this Logitech headset is the on-cable sound controls. On the cable you can adjust the audio levels using the dial as well as mute the microphone for quick audio adjustments whenever you need them. Finally, this headset has fantastic connectivity. You can chose to take up the audio in and out ports on your desktop PC, or chose to take up a single USB port on your laptop or PS4. The extra long cable makes this headset perfect for any gaming setup. Second on our list are the Sades SA902 gaming headset. This Sades headset comes equipped with high performance 7.1 surround sound effect for an immersive sound field. The two 40mm speakers push a range of 20-20,000Hz for maximum clarity. But where this headset really shines are the other features. The design of the Sades is among the best we reviewed. This headset uses a unique 4-piece design that reinforces the headband for maximum durability. Further, the ventilated ear cushions guarantees hours of comfort while gaming. The design of the Sades is perfect for gaming as it combines a unique industrial design with Red LED’s for an impressive design. The omnidirectional microphone on the Sades couples top of the line sound quality with a flexible design to give you as much control as possible over the microphone positioning. And the microphone folds up if you’d prefer to keep it out of sight. A small in-line control on the wire gives you quick control of sound levels and your microphone, making it perfect for quick sound adjustments. The Sades uses a standard USB connection, allowing it to be plugged into any desktop or laptop with a USB port for maximum compatibility. While the Sades doesn’t match the overall quality of the Logitech headset, it does couple top of the line features with a competitive price. Third on our list is the HyperX cloud stinger, which comes at a slightly higher price than the previous headsets but packs some of the best features we reviewed. The HyperX packs 50mm directional drivers for full audio precision and quality. What we really loved about the HyperX was its design. At just 275 grams the HyperX won’t weigh you down, making it ideal for long gaming marathons. 90 degree rotating ear cups allow you to customize how you wear them giving you maximum comfort, and the memory foam earpads will keep your ears comfortable and dry. Our favorite feature of the HyperX was the swivel-to-mute noise-cancelling microphone. The swivel to mute feature makes the HyperX incredibly easy to use. And the included passive noise cancellation reduces background noise for clearer voice quality. While the Stinger doesn’t have an in-line control pod, it does have a volume control on the ear cup giving you easy access to volume control. The Stinger comes with multi-platform compatibility, allowing you to connect them to your PC, Xbox One, PS4, Wii U, or mobile device using the single 3.5mm stereo plug. Fourth on our list is the Turtle Beach Ear Force Recon 50X, which gives you a premium brand at an affordable price. This Turtle Beach headset comes with 40mm over-ear speakers that let you hear “every crisp high and thundering low”. Turtle beach is known for their dedication to the gaming market, and these headphones don’t disappoint. The Recons feature the newest in Turtle Beach design, coming equipped with comfortable ear cushions and synthetic leather, and are sure to keep you comfortable while gaming anywhere you choose. We gave extra points to the Turtle Beaches because they can fold up when not in use, making them perfect for storage or for travel. The high sensitivity adjustable microphone gives great in game voice chat and can be freely adjusted to fit your needs. Plus, it can be removed for when you want to watch a movie or listen to music. The turtle beaches feature a fantastic in-line audio control pod that has an easy to use mic mute toggle and a volume wheel for lightning fast audio adjustments. The Recon 50X works with the new Xbox One controller, PS4 Pro, PS4, as well as PC, Mac, and mobile devices using a 3.5mm connection. Rounding out our list is the BeExcellent gaming headset for its extreme affordability. This headset comes with a pair of high precision 40mm drivers, which bring vivid sound and clarity, as well as ambient noise isolation. While they may not be the best speakers we reviewed, they are competitive at this price point. The earmuffs use skin friendly leather material to cut down on heat and discomfort, as well as a flexible headband designed for long periods of use. The microphone on these headphones leaves a lot to be desired. While it does come with omnidirectional noise reduction, it cannot be adjusted much or removed. We also deducted points for the lack of any form of in-line audio controls, however at this price point it’s to be expected. The headset did receive points for its compatibility, as it will work with any new gaming console as well as PCs and mobile devices. While it is lacking in features, the BeExcellent headset comes at a price that simply cannot be beat. A good gaming headset will be something you use for hours on end and rely on for competitive gameplay. Each of the headsets we’ve showcased here will give you great sound quality and awesome features for an affordable price. Our top pick was the Logitech G430 for its great sound quality, abundant features, and top quality design. However, each of the headset we featured here bring something new to the table, and are sure to upgrade your gaming experience. We take a look at the Best Gaming Headsets under $50 that will provide you with an immersive gaming experience. There's plenty of good budget options! Are gadgets with free gifts really worth it?